Februar 2012 – Schwein gehabt? Here are some contacts for this outrage. I will also forward a letter that you are free to use or change as you wish. Forward to those interested in animals. Investigation Team has ever witnessed. Pozo (the second largest pig meat producers in Spain). products to the leading supermarket Morrisons. established these methods as the norm for killing animals at the farm. intestines, liver and other internal organs while she suffers terribly. Further news about the issue and future campaigns. Indonesia: New investigation. Same cruelty. viaIndonesia: New investigation. Same cruelty..
Verspreche dass sie nicht umsonst sterben werden, trage diese Bilder hinaus um wachzurütteln… der LKW startet..
Ich werde mein Versprechen halten, ein Leben lang für die Schwächeren und Gequälten kämpfen !!! … noch ein letzter Blick… der LKW fährt los.. This week, McDonald’s stated that they will be requiring all U.S. pork suppliers to stop using hog crates and gestation stalls. These crates are cages that tightly confine an animal’s movements, preventing them from being able to turn around and in some cases to walk at all. Gestation crates are used to keep pregnant sows separate from one another and preventing aggressive behavior. Wayne Pacelle, the Humane Society’s CEO, says the move will have “seismic impact” on animal welfare, and that the choice not only demonstrates that abandoning the use of hog crates is morally right but also economically feasible. McDonald’s is one of the largest buyers of pork products in the United States, with offerings like the McRib and various sausage sandwiches. The fast food company accounts for about one percent of the total pork consumption in the country. Other restaurant chains have moved away from suppliers who use gestation crates, including Wendy’s, Hardee’s and Burger King. Chipotle Mexican Grill has ended all relationships with suppliers using the crates, as illustrated in this moving commercial that aired during the Grammy’s. 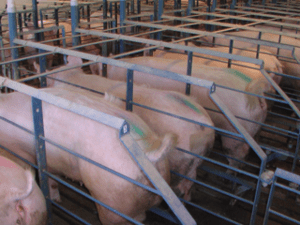 Many pork suppliers in turn have made steps to reduce the use of hog crates, particularly as animal welfare groups have been pushing for legislation banning them. Cargill says it has already adopted group pens for pregnant sows, while Smithfield Foods and Hormel Foods say they will get rid of gestation crates by 2017. Regardless of your stance on the McRib, fast food or eating meat at all, getting corporations like McDonald’s to push for less cruelty in the livestock industry can be a huge force for good. However, given the large number of other ethical and health problems with the commercial meat industry, abandoning hog crates seems like a drop in the bucket. If only they would demand more. here some articles before! Thank You! Ein Albtraum für Veganer und Vegetarier! Daenemark: Danske svin ta´r din medicin! This is one Vietnamese festival that makes even non animal lovers cringe. Every year, at a village near Hanoi, a pig is brutally chopped into two so that people can smear banknotes with its blood in the belief that it would bring luck. Farmer Nguyen Hung Truc waves battle flags as he portrays Doan Thuong, an anti-royal military general who lived in 13th century, during a festival at the Nem Thuong village in Bac Ninh, about 40 km (25 miles) north of Hanoi, January 28, 2012. Organized by the villagers, the festival is held on the sixth day of the first month of the lunar calendar to worship the village’s deity Doan Thuong. Every year, thousands of people from the village and nearby villages will gather to smear the blood of the pig on their banknotes in the belief that it would bring luck in the new year. The festival is known as the most brutal in the country and is condemned by many, including some who called on the government to stop the festival. Villagers play traditional music as they take part in a festival at the Nem Thuong village in Bac Ninh, about 40 km (25 miles) north of Hanoi, January 28, 2012. DEVILISH; ARCHAIC; PLEASE; IF YOU WANT TO SEE THEM – SEE MORE THERE! I wish to express my deep concern about animal cruelty being conducted in the name of tradition in Vietnam. On 28th of January 2012 – like every year – citizens at Nem Thuong village have celebrated their cruel festival during which a pig is brutally chopped into two. Every year, thousands of people from the village and nearby villages gather to smear the blood of the pig on their banknotes in the belief that it would bring luck in the new year. The festival is known as the most brutal in your country and is condemned by many, including some who called already on your government to stop the festival. No one can adequately explain why these practices are carried out year after year – except to say they are „traditional“. This however is not a valid argument to continue these practices. 1. It hurts the animals – contrary to what many believe, animals suffer tremendously before and during such festivals. 2. It hurts us – cruelty against animals harms society as a whole; it signals and normalizes insensitivity in children who can become numb to the suffering of living beings. It is also known to influence certain people to commit violence to other humans. 3. It is bad for tourism – as tourists are abhorred by such practices, the festival will have an adverse effect on tourism, an industry which provides the country with much-needed financial returns. Those foreigners who experience or come to know of this practice leave Vietnam confused and with a heavy heart, rather than uplifted by its paradoxical beauty and friendliness. I implore you to end these violent practice and help Vietnam move towards a truly peaceful country in keeping with its international image. I trust that you will support these measures (which are becoming more widespread around the world) and thus promote non-violent cultural practices in Vietnam. Until such a time, however, I regret that it will be necessary to boycott Vietnam both as a tourist and by way of commerce and to encourage others to participate in a boycott as well. Patent For A Pig: The Big Business of Genetics: The American biotechnology firm, Monsanto, has applied for a patent for pig breeding in 160 countries. The patent is for specific parts of the genetic material of pigs which Monsantos genetic researchers have decoded. If this patent is granted, pig breeding would be possible with the approval of the company. Farmers and breeders are naturally alarmed because these genes have long existed in the great majority of their pigs. Using DNA tests they can prove that there is no new invention in the patent applications but that, instead, granting this patent would be to allow a part of nature to fall into the hands of a single company. Monsantos influence on the patent offices is huge. If the patent is approved, money will have to be paid to Monsanto for e very pig in the world carrying this genetic marker. This has long been the case for certain feedstuffs, such as genetically modified maize. Many farmers in the US have already become dependent on the company. It is not merely a question of money, however, but also a question of the risk posed to consumers. In America, as in Europe, cases of infertility in animals fed with genetically modified maize are becoming increasingly common. No-one yet knows what effects such products are having on humans. Bauen, das sollte man annehmen, darf man in Deutschland nur mit den entsprechenden Genehmigungen. Für einen der größten Schweinezüchter Europas scheint diese Regel offensichtlich nicht so wirklich zu gelten. Abgeschirmt hinter den Fassaden vorhandener Stallreihen soll das Unternehmen einfach dreist immer weiter ausgebaut haben. Während aufgebrachte Anwohner fürchten, dass rund um ihre Orte klammheimlich riesige Mastanlagen entstehen, scheint niemand das Treiben des holländischen Unternehmens stoppen zu können. Expandieren bis zum Kollaps – Wie immer größer Tierfabriken entstehen und warum die Ämter hilflos zuschauen. Das und mehr sehen Sie am Mittwoch, um 20:15 Uhr, in Ihrem MDR-Nachrichtenmagazin Exakt.